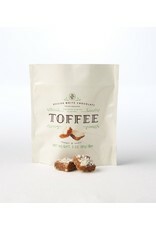 Pecan toffee, sprinkled with Belgian white chocolate bits. 3 oz. 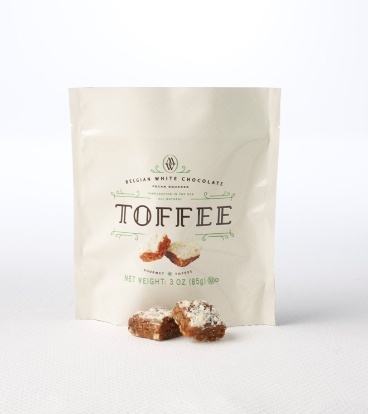 INGREDIENTS:Butter (cream,Salt) Sugar, White chocolate(sugar,cocoa liqour, defatted cocoa powder, whole milk powder,skimmed milk powder,whey powder,cream powder,milk fat,lactose, emulsifier,natural vanilla extract),Pecans. ALLERGY INFORMATION: Products have been produced on shared equipment with peanuts, tree nuts, milk, eggs, soybeans and wheat.